I have acquired quite the washi tape collection lately. I like to seal my shop orders with it to add some extra cuteness. I bought the majority of my collection from Pretty Tape but I also recently picked up a pack from Target’s new office supply line (4 rolls for $4!). As my collection kept growing I was having a hard time keeping it all organized. I put together this handy tape holder this weekend. I bought a wood dowel for a a couple bucks at Home Depot. I considered getting wood for the base while I was at Home Depot but I thought it would be easy to find something to re-use, rather than getting something brand new. I went to the thrift store and kept my eyes out for coasters, a small decorative plate, or you could even use a lid to a mason jar. The possibilities are really endless. I found a set of coasters for $1.49. We actually needed new coasters anyways so I bought the set and used one of them for the base. Since the base that I found was wood I ended up using a flat-headed screw to attach the base to the dowel (Jordan helped!). If the base you find is not wooden you could use a strong glue to attach it. Once assembled, I chose to spray paint it white, since the two woods I was using didn’t match in color. Now my tape stays nice and organized and doesn’t take up a lot of space! I looove getting more organized because trust me, my office doesn’t always look like this. If you have any other easy tips please share! That looks great! 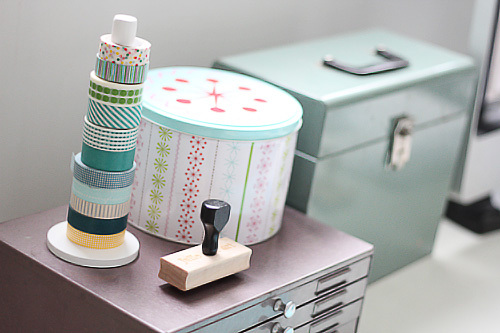 I’ve added a bunch of washi tapes to my collection this weekend and am in dire need of a holder of sorts too. 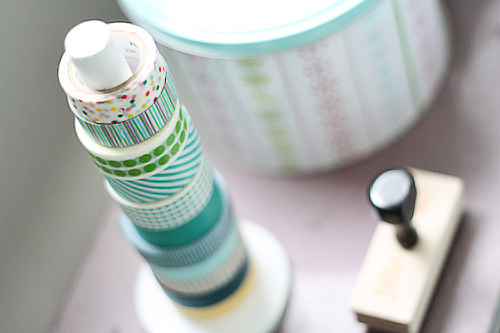 Wow cool idea to display and keep track of the washi tape, Thanks for sharing and have a wondeful Day. oh thank you for this great idea!! ive got 9 rolls of washi tape now and intend to buy more! lol. I got the same green ones at target,love em!! you did a great job!! cute! I store mine in used cigar boxes. I bought them for $1 each and I love the different looks of each box. I labeled the outside. I have a lot of tape so I have several boxes. For my masking tape collection I just took the top of the box off for easy access. They fit on my desk perfectly. Thanks for this tip. Great idea. This is such a cute idea! Love it. i bought the same rolls from target 🙂 what a clever way to store. Cute! I saw an unfinished paper towel roll at a thrift shop that would be perfect for this project, too. Now I’m wishing I’d snapped it up!